GODAN Agricultural Sector Package Working Group invites you to take part in a consultation of the second Open Data Charter Sector Package: ‘Open Data for Agriculture’, through an open participative process. GODAN is looking forward to your answers on the consultation and kindly invite you share this consultation within your network. to support the use of the open data by the target group. references to data standards and an overview of remaining gaps and implementation challenges for policy makers. 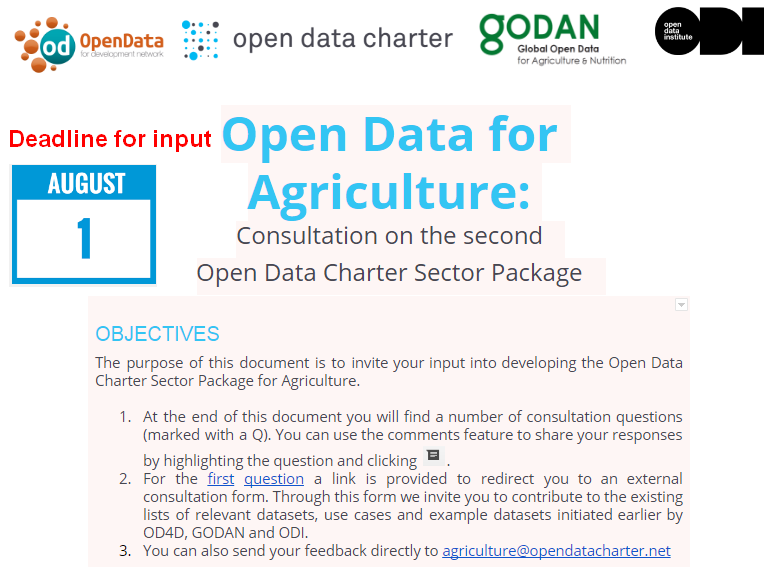 STEP 2: Based on the input on the consultation document a first selection of key datasets and categories for the Open Data Charter Sector Package for Agriculture will be prepared in August. The selected key data sets and categories will be discussed during a stakeholders workshop at the GODAN Summit 15-16 September 2016 in New York. STEP 3: Also in August, the use cases collected via this consultation will be expanded into case studies using telephone interviews. STEP 4: In October, a discussion on data standards in relation to the agricultural key data sets and key categories will be held during the IODC conference 6-7 October 2016 in Madrid. STEP 5: The resulting Charter Sector Package on Open Data for Agriculture will be discussed with the intended user group of policy and decision-makers at the OGP Global Summit 7-9 December in Paris, alongside two other Open Data Charter Sector Packages (anti-corruption and climate change). STEP 6: After the launch the Agricultural Sector Package will be further maintained and updated in the future by GODAN and OD4D.